Operators are stretching summer menu launches into August, promoting lighter fare and peak ingredients that jibe with the season. 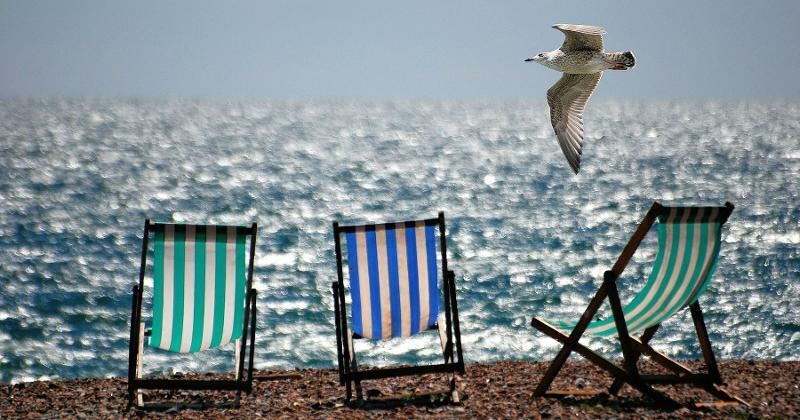 Summery flavors and colors are strong in many of the new food and drink items, prolonging that vacation vibe, while some offerings catch the spirit of backyard cookouts and beach bars. Here’s how seven chains are freshening up their menus to build late-summer traffic and keep guests coming back for more. Global flavors and farm-fresh produce inspired six new menu items at this better-for-you restaurant chain. 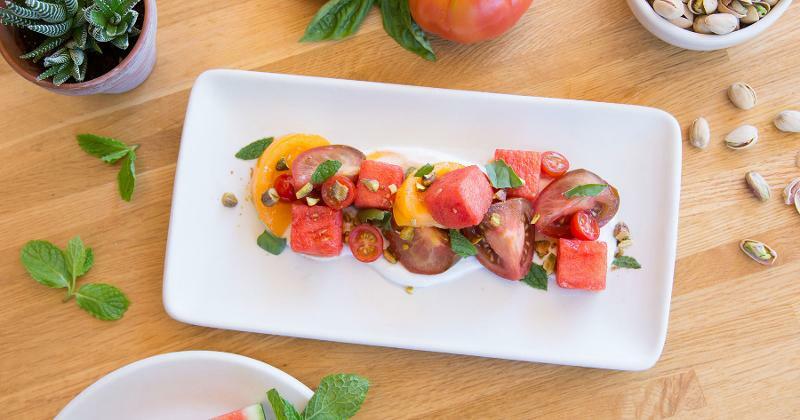 A summer starter, Heirloom Tomato and Watermelon, makes the most of the seasonal bounty; it’s served over a dairy-free coconut lime yogurt sauce and garnished with fresh herbs. True Food Kitchen’s new Korean Noodle Salad features cold sweet potato glass noodles tossed with raw bok choy and kale, cucumber kimchi, mango and bean sprouts. And berries and melon flavor three summery cocktails: Blueberry Mint Mimosa, Watermelon Mojito and Wild Orchid (made with lemon-infused vodka, blueberries and lavender). Swordfish is the latest seafood to debut at this fast casual. The grilled swordfish, a species more typically seen on casual-dining and upscale restaurant menus, is prepared Peruvian-style. It’s topped with aji salsa—a condiment made with yellow chili peppers native to Peru. 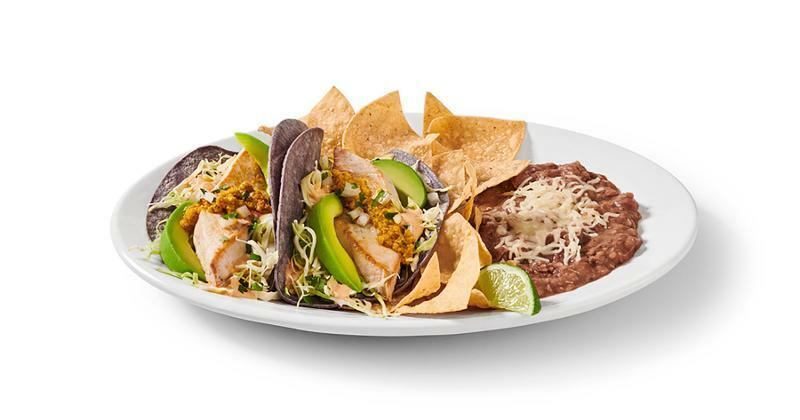 Customers can order Peruvian Swordfish in either a two-taco plate or a bowl. Two other tacos also join the chain’s summer roster: mango shrimp and chicken with fire-roasted corn. 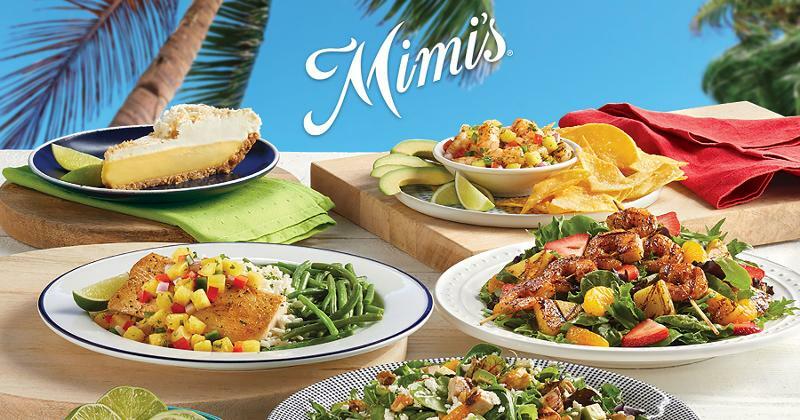 Seafood also stars on the Fresh Summer Catch menu at Mimi’s Cafe. The lineup includes Tropical Shrimp Ceviche, featuring grilled shrimp and handmade pineapple salsa, the same salsa that garnishes the chain’s Hawaiian Mahi-Mahi. A Citrus Chicken Salad veers away from the seafood theme, as do several new drinks. These include a Wildberry Daiquiri made with rum, fresh lime, strawberries, raspberries and blackberries, and Summer Peach Lemonade, a mix of fizzy white wine with white peach, lemon and cranberry juices. 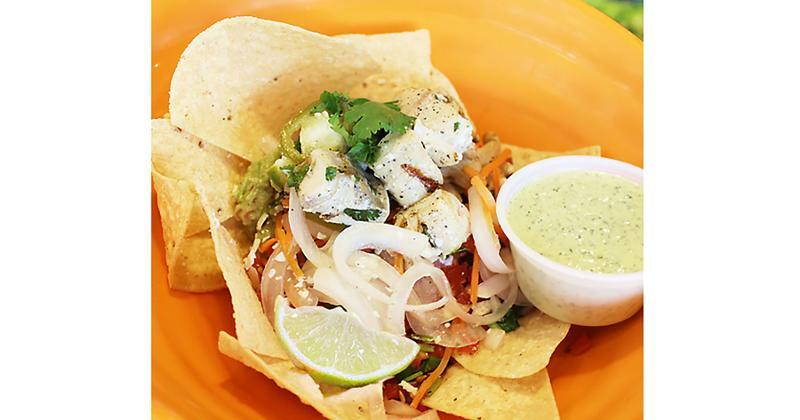 Mahi-mahi is trending this summer, also showing up in an LTO bowl called Cuenco Escabeche at Lime Fresh Mexican Grill. Customers can opt for the fish to be grilled or fried, then paired with housemade pickled vegetables, Mexican rice, black bean and corn salsa, guacamole, pico de gallo and cotija cheese. For meat lovers, there’s the Brisket Taco—a combo of slow-roasted brisket, salsa and pickled vegetables. Gazpacho goes green with Zoup’s new variation called Avozpacho. 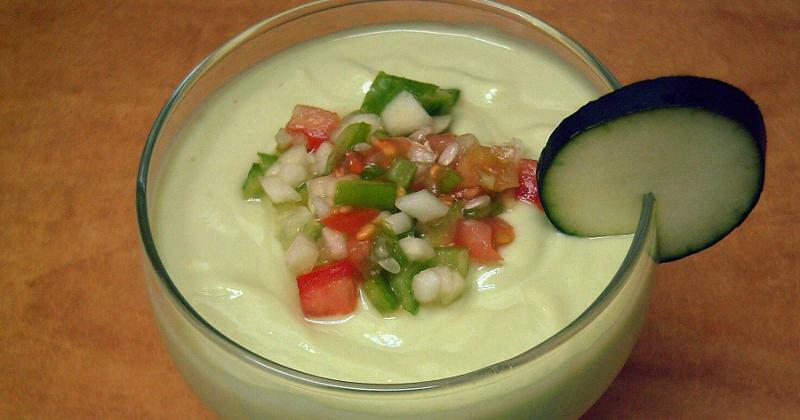 It’s built on a base of avocado puree mixed with fresh vegetables and roasted jalapenos. Back for a second season is the chain’s Simply Gazpacho, a more traditional blend of cold spicy tomato soup with cilantro. Zoup is also introducing Family Meals, a new offering that bundles a large container of soup with bread, salad and sandwiches or bowls. The full meals can feed two, four or six and start at $21.95. 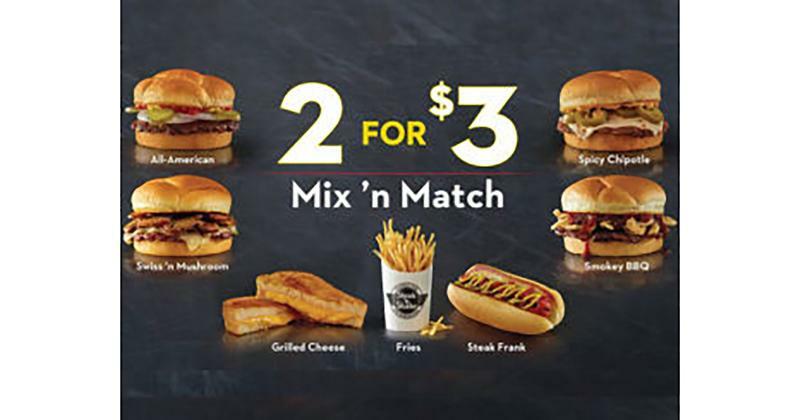 The Buffalo Ranch Steakburger and Butter Steakburger are the two newbies on Steak ’n Shake’s 2 for $3 Value Menu. The first variation is flavored with Buffalo sauce and ranch dressing, while the second is topped with butter, grilled onions and American cheese. Deal seekers can enjoy the LTOs through the remainder of the summer by pairing the two or mixing-and-matching them with any of the other seven items on the value menu. The fast casual known for its customizable and house-crafted salads is taking healthy eating in a liquid direction this summer. 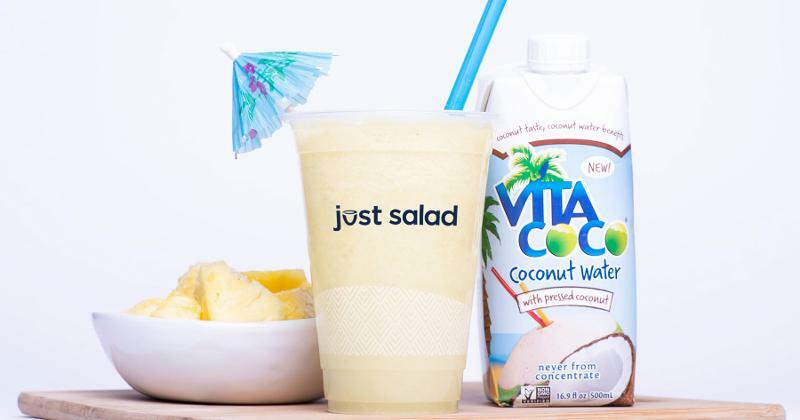 Just Salad introduced a pina colada-inspired smoothie made with coconut water, pineapple and agave. The healthy tropical refresher can be ordered as part of the chain’s Pick 2 combo, partnered with a salad, avocado toast or grain bowl.